Tom Worstell’s community hats come in many colors, shapes and sizes. 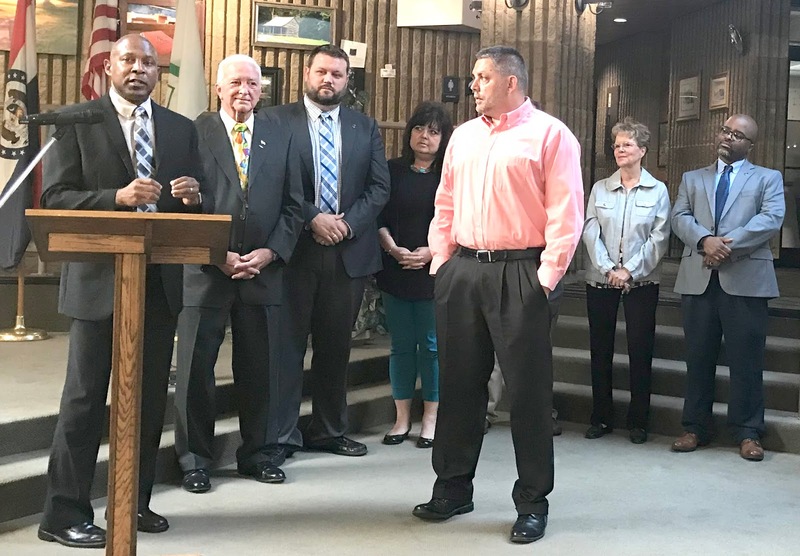 He is more than the pastor of Southview Christian Church in Grandview; he serves as a Police Chaplain, volunteers his time with the school district and at community events, and he’s recently been named the City of Grandview’s Civic Leader of the Year. He grew up in the small Missouri town of Milan, and attended Central College of the Bible in Moberly, with the intention of becoming a youth pastor. After graduating, he landed the job at Southview Christian in Grandview, which has been his church home ever since. It is that common goal of community betterment that sparked Worstell’s interest in becoming involved in more than just his church. He says that he is blessed to be in a church that not only allows him to be a part of the community, but also encourages and supports him to do so. While he may be the face of the church, he said, it’s the members of Southview Christian who are really doing the work. A decade ago, Southview Christian was considering a move out of Grandview, looking at properties in Belton. The church felt like it had hit a point where they were no longer able to build on what they had in Grandview, and so naturally, the community service aspect of the church dropped off significantly. It was then that the church elders, and now Pastor Worstell decided to become more invested in the community, which didn’t happen overnight. He took on the notion that not only is he the pastor of Southview Christian Church, but he’s a pastor of the Grandview community as a whole. Worstell also serves as a chaplain with the Grandview Police Department. He says that the opportunity allows him to see a side of Grandview that he didn’t see before. The chaplains are there to assist officers and fire personnel with whatever they may need assistance with, sometimes being the person who breaks bad news to family or other similar tasks that police may not be trained in handling. He said it has helped build other connections in the city, with the Pastor’s Alliance being brought back to life between church leaders. Being a chaplain has helped him become a better pastor to his congregation. The police ride-alongs, Worstell said, give him sermon material he wouldn’t otherwise have had. Worstell and his wife, Nikki, have been together for 21 years this fall. Probably his most important job is that of dad to three sons: Thomas, 18, Jonathon, 16, and Timothy, 14; and to his daughter, five-year-old Hope, who was adopted by the family when she was born. Apparently the dog didn’t cut it for Mrs. Worstell, and the family began looking seriously into adoption. After almost a year-and-a-half of not connecting with the right birth mothers, the Worstells received word that a baby girl had been born in Wichita, and if they could get there that night, she would be theirs. The family took out a second mortgage on their house in order to pay for the adoption, but with the help of grants, their church friends and family, the Worstells turned around and paid off the loan in a week. 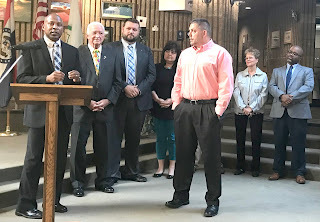 Worstell was recognized by Grandview Mayor Leonard Jones and the Board of Aldermen on Tuesday, July 24. He received a mayoral proclamation naming him as the City of Grandview’s Civic Leader of the Year.